IMTS 2002 - A. S. Thomas, Inc.
A. S. Thomas, Inc. is proud to be present at IMTS-2002 with the following manufacturers: Mikron-Bostomatic, Booth D-4000, and MDSI/G&W Machine Tools, Booth D-4232. Mikron HSM 400U 5-axis machining center showing live machining of an impeller. 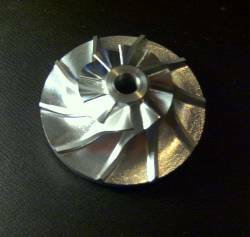 A. S. Thomas, Inc. has developed this and numerous other production machining processes which have provided dramatic reduction in machining cycle while improving part quality and consistency. The NUFORM CAD/CAM System as well as various Expert systems were demonstrated. The Expert Systems demonstrated included Blade Milling Expert Systems and other Knowledge Based CAE/CAD/CAM Systems designed to solve numerous manufacturing problems. A.S. Thomas, Inc. has provided a large variety of turn-key manufacturing solutions across a wide spectrum of products, including: medical instruments, surgical saw blades, turbine blades, thread rolling dies, feedscrews, tooling hobs, etc.